Most of us, at one time or another, have had to deal with a computer virus. Usually it means running your antivirus program and sometimes your anti-malware. Sometimes it even means Googling from a different computer for hours or asking a friend’s help to fight the digital demon. It can take a lot of sweat and tears, but eventually you defeat it. But have you ever experienced one of these destructive viruses? The types that cause companies, industries, even governments to come to a screeching halt with billions of dollars in damages? Let’s hope not. Knowing of the worst viruses to ever be unleashed on the world will help you understand the need for appropriate protections. And maybe even how to keep your private files private. So let’s look at the five most destructive computer viruses of all time. We’re including trojans and malware in this list since they’re usually grouped together. This is one of the first major, and still most damaging, computer virus ever created. Created by Filipino programmers Reonel Ramones and Onel de Guzman, this virus infected computers through email. It appeared as a love confession for the recipient. Once people clicked on the attachment, it immediately sent itself out to everyone in the user’s email list, as well as overwriting files and making the computer completely unbootable. The computer would also copy passwords and then send them back to the virus authors. This was potentially catastrophic for large corporations and governments. Spreading to roughly 50 million computers in just 10 days, it caused the CIA, Pentagon and a host of large corporations to shut their email systems down. The total damage is estimated at between $10 – $15 billion dollars. This virus was created by David L. Smith in 1999 and came at a time when people were still relatively trustworthy of suspicious links. The virus was initially masked as an infected Microsoft Word document that was posted as a list of passwords to pornographic websites. At that time, a list of that nature was high in demand and many people tried to download and open it. However, when they did, they got a nasty surprise. The virus would send itself to the top 50 people in the user’s address book and this put a lot of pressure on email traffic worldwide. It was so disruptive government and corporation email services were affected, and some corrupted documents even had Simpsons references inserted into them. Because he helped the FBI in catching other virus creators, Smith famously got off after only 20 months in prison and a $5000 fine. It is estimated that the Melissa virus caused $80 million worth of damages. In July 2001, a nasty worm was discovered, dubbed Code Red—named so because the discoverers were drinking Mountain Dew Code Red at the time. The infection is estimated at more than 1,000,000 computers with more than $2.6 billion in damages. The Sobig Worm was an August 2003 computer worm that infected connected Microsoft Windows computers. Sobig was not only a computer worm based on its replications, but also a Trojan because it tries to mask itself. The variant F was the most successful, but earlier variations were attempted. Sobig.F would usually arrive in emails with the subject as Re: Thank you!, Your details, “Re: Details,” and many others. Due to the sheer volume of emails that it was able to send, the worm eventually brought down computer traffic in Washington, D.C., slowed down the computer systems of large corporations and even caused Air Canada to be grounded. An estimated 2,000,000 computers were infected with roughly $37 billion in damages. Perhaps the biggest, or at least most damaging, of all 5 top computer viruses, MyDoom definitely takes the cake. Mydoom was discovered by a Craig Schmugar, a McAfee employee at the time, who noticed the line of text ‘mydom’ in the program’s code. He added doom into it, believing that this worm would be huge. And he was not wrong. Mydoom became one of the fastest email worms to spread around the world since ILOVEYOU. The worm appears as an email transmission error and has an attachment of itself. If the user clicks on it, it immediately sends itself to all the email addresses in the user’s address book. It spread like wildfire across the internet, and many believe on the day of its release that it slowed the internet down by up to 10%. It has infected roughly 2,000,000 computers and is estimated to have caused $38 billion in damages. Update your antivirus software. Set up automatic updates for your important apps and antivirus/antimalware programs. That way, you won’t need to remember to update them manually. Nonetheless, check regularly to make sure the software is up to date. Do not click on links or attachments in suspicious emails. A lot of hacking and malware efforts succeed because people trust emails received from random strangers. This is known as phishing, and it happens to many people. It allows hackers to steal your financial information and other sensitive data. If you don’t know or trust the source, don’t click on the link or attachment. Be careful on public hotspots. Public WiFi is very convenient; however, it does leave you open to man-in-the-middle attacks and other nefarious ways for hackers and snoopers to get your information. When on public WiFi, don’t check any sensitive information. Even better, get a VPN service, like NordVPN, which provides a layer of protection to keep your communications safe. Do not click on pop-ups. 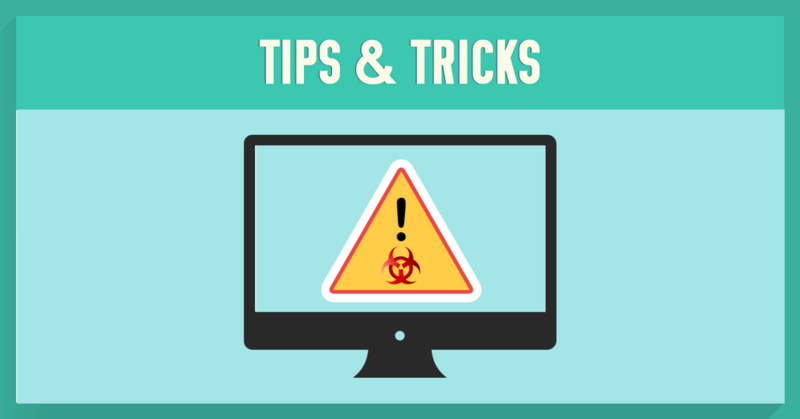 When visiting certain websites, you may get pop-up alerts that claim to have found malware or viruses on your computer. Don’t click on those pop-ups. In fact, don’t click on any pop-ups, as they will more often than not install malware or adware. Do not download pirated files from suspicious sites. Downloading things for free is tempting but may often include an added bonus of malware or adware. Be very careful on torrent sites, especially on ones you’ve never heard about. Related: Is My Computer Hacked? What do you think of these nasty viruses? Ever come across any of them? If so, what did you do to solve the issue? Let us know in the comments below!